This is one of the many installations I saw at Art Basel Hong Kong ’17 and is called Not a Shield, But a Weapon, by Filipino artist Pio Abad. I mainly wanted to study in Hong Kong to better understand the growing art market, see how museums were curated there, and to witness what was going on in the local art scene. My 5 1/2 months there definitely allowed me to satisfy all my curiosities. I think my biggest discovery was finding out that the Hong Kong government lumped together ‘art’ with ‘entertainment’. There was definitely less of an emphasis on art and art education in the past, so the government neglected to fund many art organizations/allocate funding for art. This is why many local artists were enraged that art seemed to be put on a sort of societal back-burner. Nevertheless, the local art scene still perseveres. 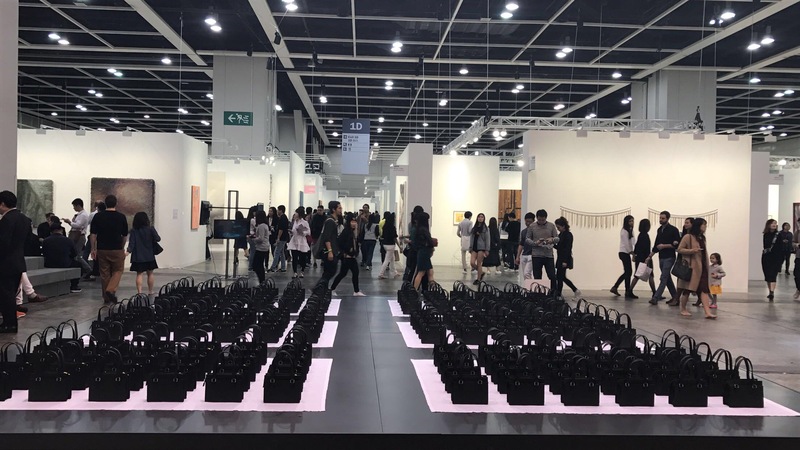 However, ever since annual Art Basel shows started up in Hong Kong, local artists and artists of color alike have been able to get more and more exposure. Although some people are quite against the commercialization of art and the idea of Art Basel as a giant, glorified showroom (I’m one of those people), I thought it was still a step in the right direction in exposing the world to contemporary artists from Hong Kong (and the rest of the world). This picture sums up a bittersweet moment. I was so happy to see a huge amount of amazing art produced by artists of color from around the world, and I was happy I had the privilege to attend such an event. At the same time, it also made me wonder how long it would take for the government to finally wake up and provide adequate funding for local artists/organizations. Someday I hope that the joy of art is spread and made accessible to the 7 million people living in Hong Kong.